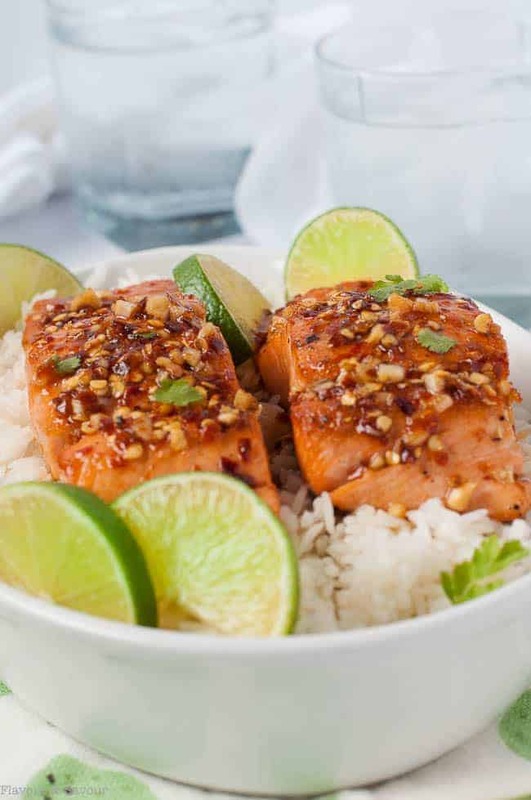 You’ll only need 4 ingredients that you probably have on hand to make the glaze for this sweet and tangy Honey Chili Lime Glazed Salmon. Cooks in 15 minutes! Paleo. 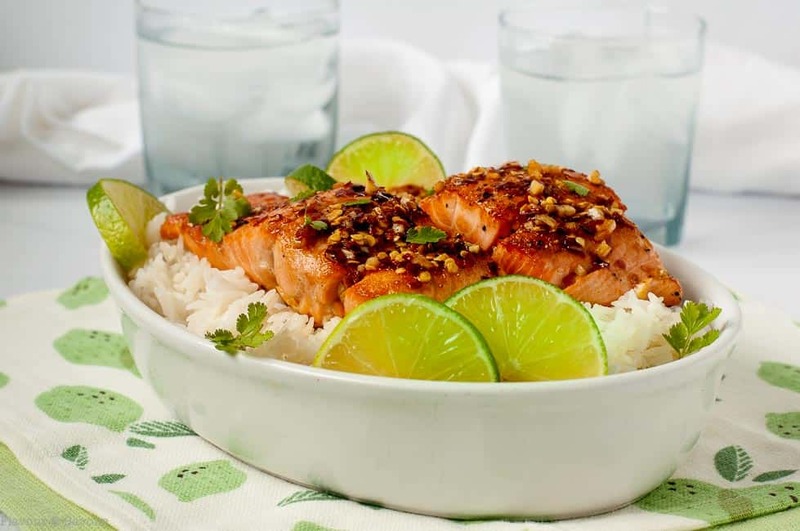 We loved this Honey Chili Lime Glazed Salmon. Why? The glaze needs only four ingredients that I usually have on hand and it takes only 15 minutes to cook. This salmon is absolutely delicious and insanely easy. Lime, garlic, dried red pepper flakes, and honey. That’s it! How easy is that? This is a great recipe for any time of the year, but I especially love this chili-lime flavour combo with summer meals. Fresh limes are inexpensive at this time of year, so I always seem to have some in the refrigerator. I use this combination a lot: in these Honey Lime Chili Chicken Thighs, Chili Lime Drumsticks, Chili Lime Shrimp with Fresh Salsa, and even Honey Lime Garlic Wings. Sear the salmon in an oven-proof skillet. Pour the glaze over all and transfer the skillet to the oven to bake. 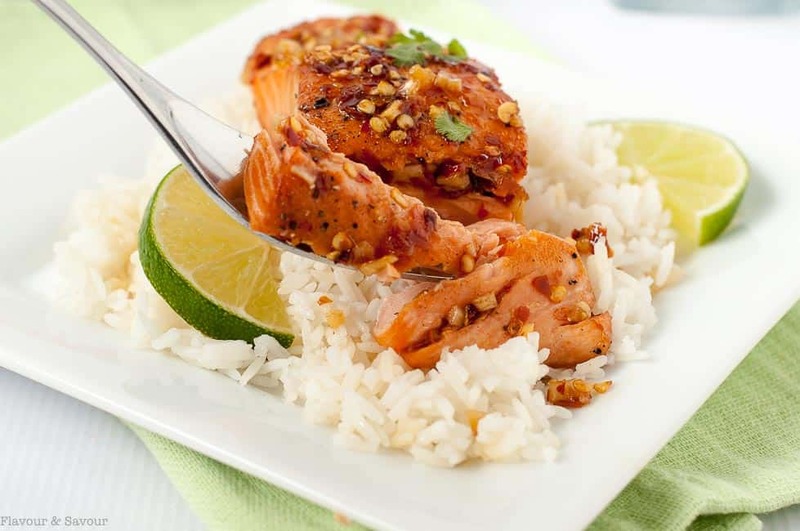 Wondering what to serve it with this easy salmon recipe? Here are a few ideas. 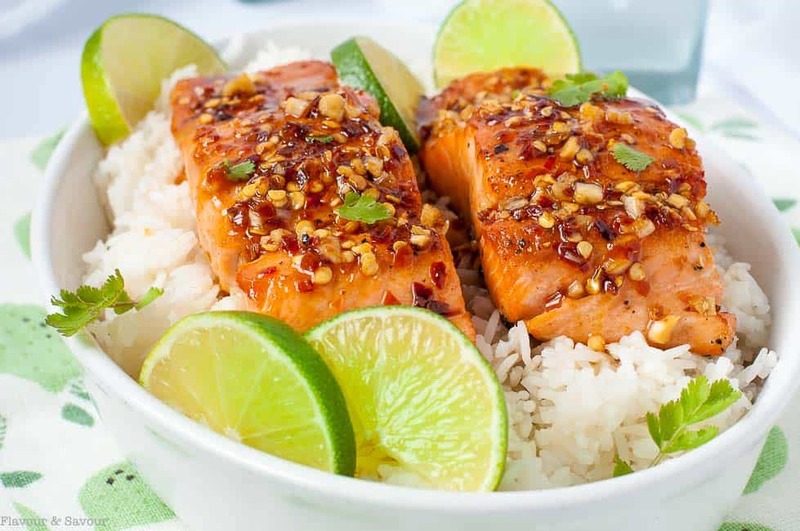 You'll only need 4 ingredients that you probably have on hand to make the glaze for this sweet and tangy Honey Chili Lime Glazed Salmon. Cooks in 15 minutes! Whisk lime juice, garlic, dried chili flakes, and honey together and set aside. Pat salmon fillets dry. Season with salt and pepper. Heat an oven-proof skillet over medium-high heat. Add oil and heat. When it ripples, carefully add the salmon fillets, skin-side up. Sear for 2 minutes, turn and sear on the other side for 2 minutes. Pour glaze over all and transfer skillet to oven. Bake for 8 - 12 minutes or until fish is beginning to flake with a fork. Time will depend on thickness of fillets. Remove from oven, spoon pan juices over top and serve immediately. You can substitute chili powder for the dried red pepper flakes if you prefer. This recipe sounds so delightful and light! Love the flavour combination! Thanks Jessica! 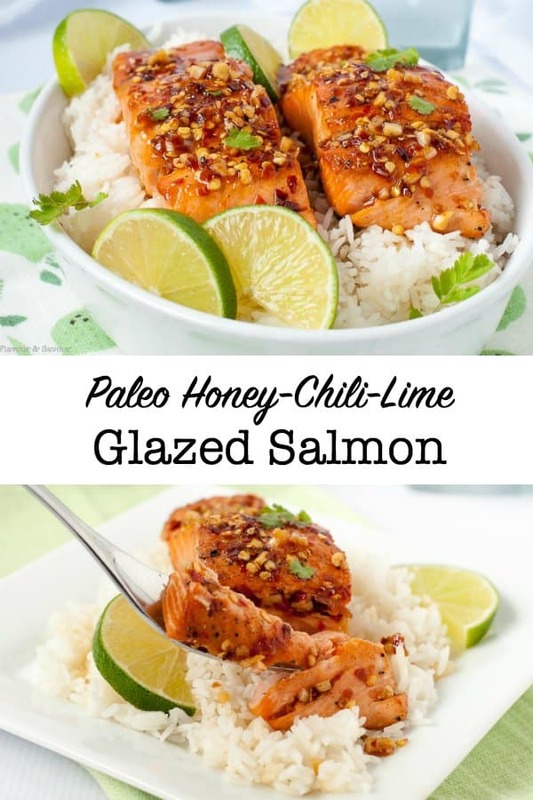 Honey Chili Lime is a favourite flavour combo of mine and I’ve used it on chicken and shrimp. too! I love recipes that are simple and delicious like this! This combination of flavours looks wonderful! I’m Pinning this recipe, as I’m sure I’ll make it more than once. Thanks Cathy! Simple is always best, in my view! Thanks for pinning! Thanks Denise! Isn’t it great to find a recipe that doesn’t require a trip to the store? This salmon looks fantastic. I absolutely love minced garlic on my salmon, for both the taste and the aesthetic. Yes–we learn from experience, don’t we!! So good and so easy!! Glad you liked it! It’s a favourite!